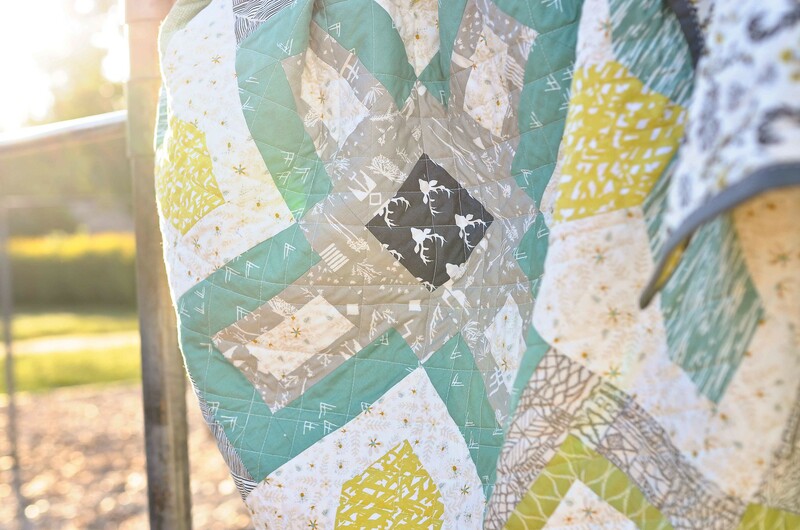 Today I get to share my version of the new AGF Stitched pattern - the Symphony Quilt. This is a great pattern because it is quick to put together. I added a few blocks to make my quilt queen sized and I was shocked how fast it came together! 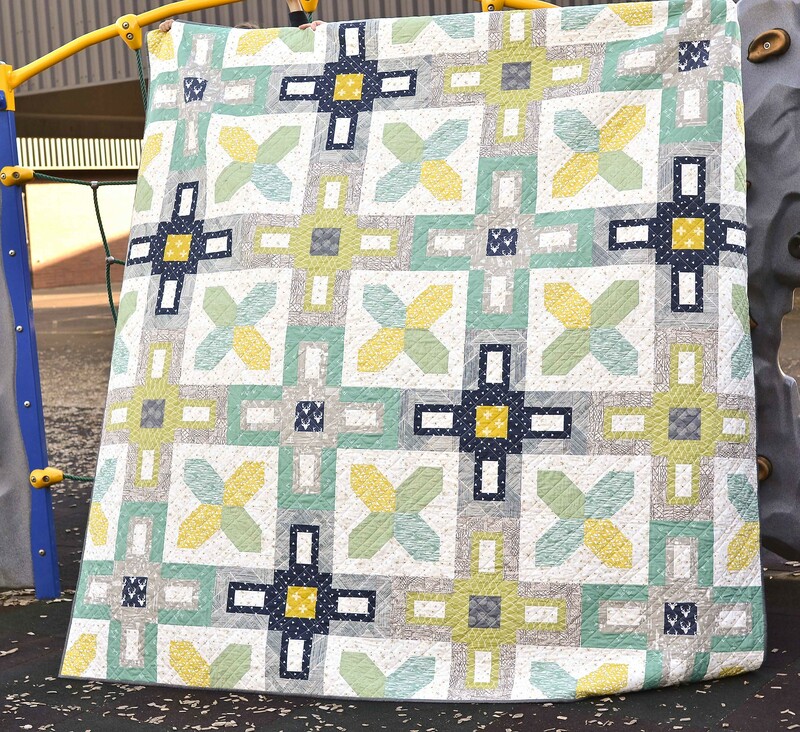 I was making this quilt with someone in particular in mind and knew that I wanted to use some greens and grays. The prints are from a variety of Art Gallery Fabrics collections. By making the quilt 4 blocks x 4 blocks, the quilt ends up perfectly queen sized - 96" x 96". I quilted mine with an organic crosshatch (meaning that the lines of quilting are randomly spaced and not perfectly straight). This is one of my favorite ways to quilt because it doesn't require marking in advance, but it still gives the quilt a nice texture. 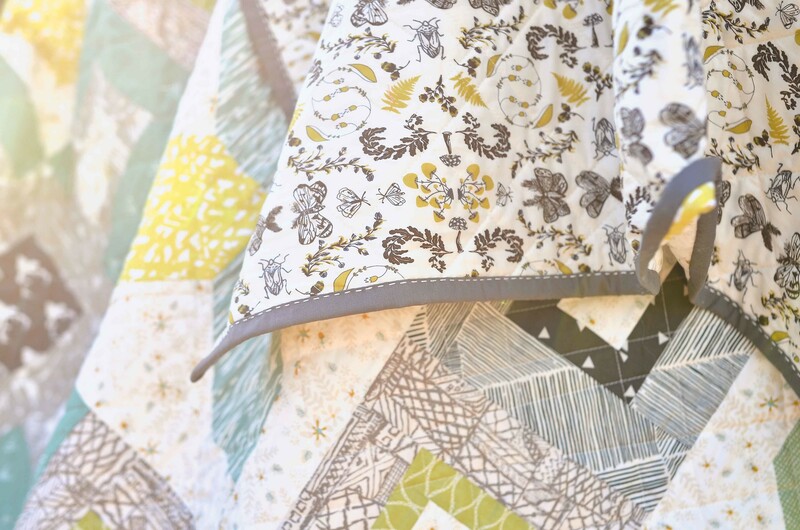 The backing for the quilt is called Forest Floor and is from Bonnie Christine for Art Gallery and it is voile! I was a little nervous about using voile for the back of a quilt this big because I tape my backing to the floor when I baste my quilts and voile doesn't stick to tape very well. But I used this method to attach the tape to the voile and ended up loving how it turned out. The AGF voile is a very nice quality and has a buttery soft feel. I attached the binding to the back of the quilt using my favorite big stitch binding. Beautiful. Love the fabric selection. Is there a link to this free pattern? I cannot seem to find it. Thanks. Love this pattern. I just watched the Fat Quarter Shop video on this today. Yours turned out beautiful! Wow, such nice fabric choices!